With a working title of Rizla due to the album's cover art (an unravelled orange Rizla pack), Jugula, as this album is often called, was released on the Beggars Banquet label and reached the UK Top 20. The album contains a number of well crafted, original songs written by Harper. It is recorded in a fresh and spontaneous manner, often with only the unique and beautiful sound of Ovation guitars and vocals. Occasionally, the spacious arrangements are filled with synthesizer and electric guitar. This album in particular brought Harper to a new and wider audience, mainly due to Harper and Jimmy Page's appearances at the Cambridge Folk Festival in 1984, an album tour and a 15 minute televised interview by Mark Ellen on the Old Grey Whistle Test (16 November 1984). The interview featured Harper and Page playing their acoustic guitars on the side of Scafell Pike in the English Lake District, a somewhat different and unusual interview for the time. Songs played included "Hangman" and part of "The Same Old Rock". The first track, "Nineteen Forty-Eightish", a reference to George Orwell's Nineteen Eighty-Four, crescendos with a fine piece of lead guitar by Page. 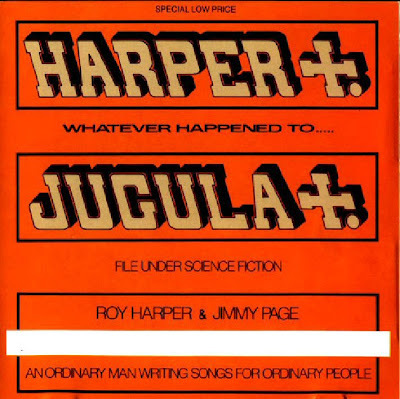 This album was the fifth that Harper and Page had worked on, but the first entire record they made together . For those used to Page's guitar playing, his input is quite evident throughout the album. Page is a natural and perfect complement to Harper's deft, fresh and unique guitar playing. Other standout tracks include "Hangman", a powerful song that expresses the feelings of an innocent man condemned to die and "Frozen Moment", a particularly beautiful song played entirely in the chord of C.
David Gilmour wrote the music for the third track, "Hope" , Harper penned the lyrics, and Nick Harper (Harper's 16 year old son at the time), played the lead guitar on this track (not Gilmour as is often mistakenly stated). A faster tempo version of this melody with different lyrics, appears on the White City: A Novel album by Pete Townshend, entitled "White City Fighting". A cover version of "Hope", with "Bad Speech" as an introduction, can be found on the album Eternity  by the Liverpudlian band Anathema, an album that Harper also makes an appearance on. Thanks a lot for your efforts - much appreciated! !